Many cities in China have ambitious agendas for healthcare reform. Recently I spent two weeks travelling across China with Brian Gallagher, Minister-Counsellor and campaign strategy director for life sciences, health and social care in UKTI China, along with other colleagues from Healthcare UK and UKTI China. We met numerous organisations keen to collaborate with the UK. Of the many visits we made, the one to Shenzhen stood out. During the course of a day, we visited Invest Shenzhen, Shenzhen Civil Affairs Bureau, Shenzhen Hospital Administration Office, Shenzhen Health Bureau and Shenzhen People's Hospital. Shenzhen, China’s newest metropolis, is home to 12 million people and has 2,600 medical organisations, including 153 hospitals. The government has the "Three-famous Project" (famous doctors, famous hospitals and famous clinics), to attract international talents, hospitals and clinics to the province. The Civil Affairs Bureau are working to integrate health support into the homes of the elderly, offering interesting opportunities for our elderly care sector, including training of care workers. The Shenzhen People's Hospital is the oldest and the biggest hospital in the city. Even though it already has 2,300 beds and 3,700 staff, it is expanding. An extension is under construction to provide a further 1,300 beds. 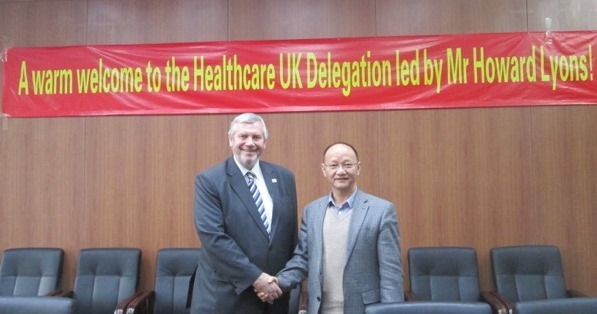 The hospital’s chief, President Qiu, is convinced that staff are the most important element of any hospital and learning from international partners like the UK is essential. Having been approached by the local South Technology University to set up a joint college for postgraduate degree courses, he is very keen to find a British partner organisation that can offer international degrees. This is a very promising opportunity for the UK’s outstanding universities and we are working with them to introduce partners for doctor training and postgraduate studies. Along with very well trained staff, President Qiu is also making sure that the hospital is at the forefront of technological development and the staff. For example, a government-funded team of general practitioners sit in a 'virtual hospital' that receives data from Shenzhen citizens via a free health monitoring app. Any irregularities in a patient's readings are quickly acted upon with online consultations. There is much for the UK and China to share in the use of digital technology to reduce the reliance on hospital resources and deliver healthcare in the community. This trip is just one example of the extensive programme Healthcare UK and UKTI China run to assist organisations do business in China. For example, the digital health demonstration centre has been a resounding success in building relationships between British and Chinese organisations. Catch up with our latest blog post on the most recent outing of the demonstration centre in Beijing, Guangzhou and Hong Kong. If you are interested in exploring the many opportunities in China for UK organisations, we would be delighted to hear from you.